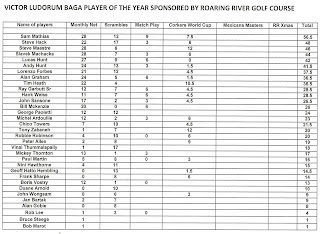 The 2013 Corkers World Cup Golf Tournament took place on June 1st at a re-hydrated Roaring River Golf Course, with the fairways and putting surfaces glowing a succulent shade of green after the recent rains. 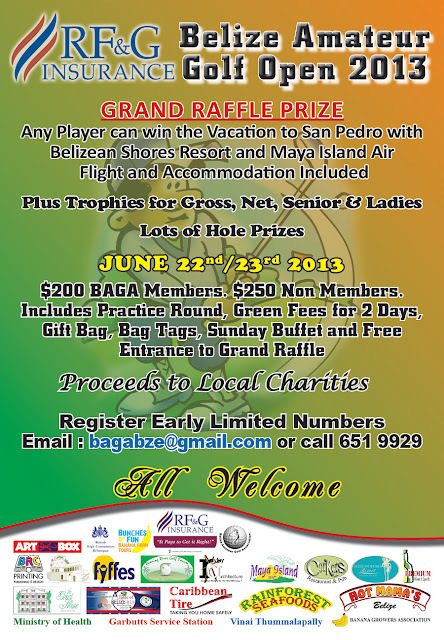 All bodes well for the RF&G Belize Amateur Open on June 22nd/23rd. Don't forget to sign up before the tournament. We will not be accepting entries on the day of the competition. Deadline to sign up Thursday 20th June. See flyer below. Back to the Corkers World Cup. Thks to all the sponsors, especially Geoff and Sam from Corkers Restaurant and Bar. Thks to all the other sponsors who made this event possible. Quality Poultry, Tropigas, Premium Wines and Spirits and Hot Mamas. $1,000 was raised for the Children of Hope Charity. 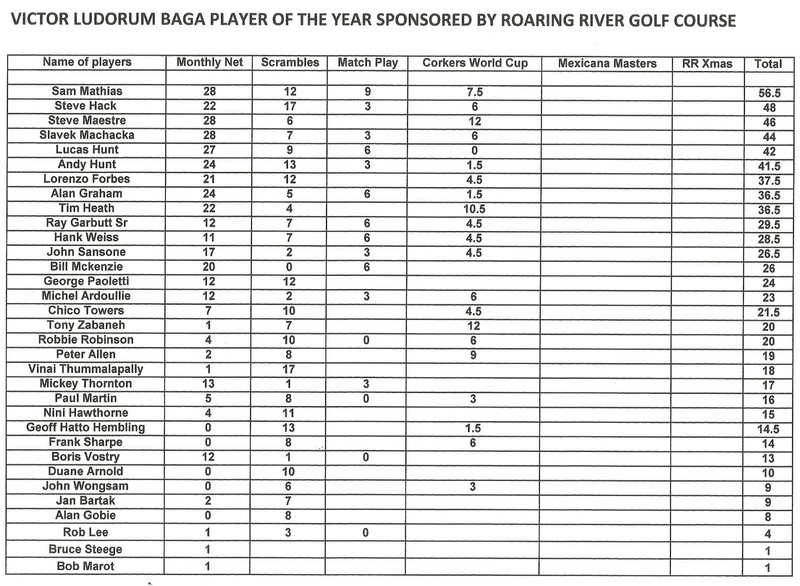 Fourball Matches : 4 Points Belizean Americas - 2 Points Belizean Internationals. Chico Towers and his Zoot Suit. 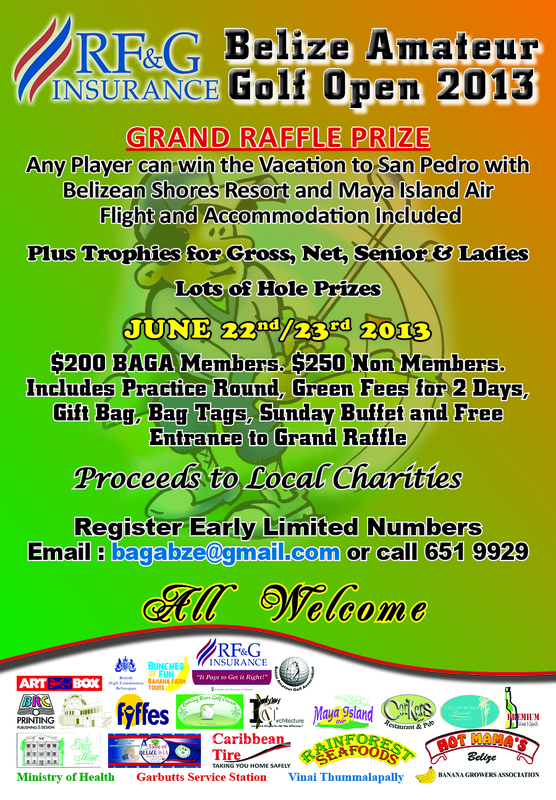 Scramble Matches : 2 Points Belizean Americas - 4 Points Belizean Internationals. Singles Matches : 5.5 Points Belizean Americas - 5.5 Points Belizean Internationals. Incredibly, after 6 hours of team play the tournament came down to the final pairing of Alan Graham (Internationals Captain) and Tim Heath (Americas Vice Captain). The match was halved meaning the teams scored 11.5 points each. Belizean Americas retain the trophy for 2013 as they only needed to draw to hold the trophy. Congratulations to the Belizean Americas who have now won the trophy for 3 consecutive years. A valiant effort by the Belizean International team, who matched the Americas team shot for shot but were unable to win the final 0.5 point to grab the trophy. Team Hero award : Steve Maestre who won all 3 matches for a combined +11 holes victory. Other notables include Tony Zabaneh and Peter Allen who won all 3 of their matches. Best Loser Award : Lucas Hunt who lost by a combined -11 holes. Lucas our youngest player also deserves a mention for playing on after being struck on the collar bone by a ball at the start of his final match. Other notables include......we will leave that for your conjecture. Best Dressed Player : One player shone from the moment he arrived. 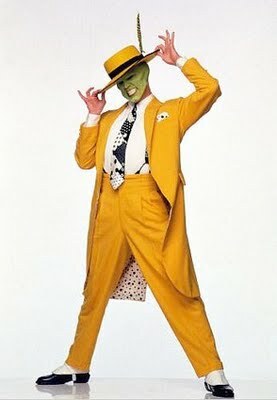 Looking like an extra from "The Mask" his Yellow Zoot Suit brought a smile to everyones face. Congrats to CHICO TOWERS. Members of the winning team from Left to Right (Tony Zabaneh, Lorenzo Forbes, Rafael Samuda, Tim Heath, Frank Sharp, John Sansone - Captain). Plus a cameo from the Internationals Captain, Alan Graham). Other players from the victorious team were Hank Weiss, Ray Garbutt Sr, Steve Maestre, Frank Sharpe, Jack Robinson, Robbie Robinson. Victor Ludorum Player of the Year.